Insulated Doors are extremely popular due to an ability to withstand high usage, ease of use and protection from noise and draughts. They can also be used as fire rated / fire resistant doors. Operating options for our insulated sectional overhead doors include push up/haul chain or three/single phase electric motor. lifting system include standard lift/high lift or vertical lift. Extras include Vision panel/wicket gate. Our Roller Shutters in Manchester are suitable for pretty much any building and any usage so whether it's up and down all day or just to partition off your workshop, they will offer you a high level of security and most importantly, reliability. 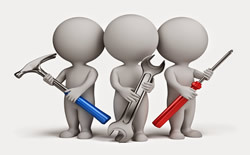 If its an Emergency repair due to malfunction, operator error or impact damage or a routine repair due to general wear and tear Uk Doors & Shutters Ltd have the resources and experience to carry out a quality repair quickly and efficiently. 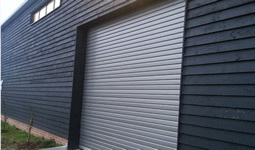 At Uk Doors & Shutters Ltd we are specialists in all types of industrial and commercial property doors. We can supply & install high quality doors for a wide range of purposes. 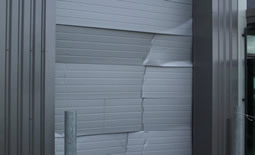 All industrial Insulated doors will require some form of maintenance to keep them in top working condition. It is also a requirement to comply with H&S legislation. AT Uk Doors & Shutters Ltd, we can provide a service contract to suit your requirements, even if we did not install it. Contact us now for a free Insulated Shutter Repairs quote in Manchester. Call now for a Free no obligation quote on a Insulated Roller Shutter Repair in Manchester.